Bitweasil lead developer going to Demonstrate an open source Tool called "Cryptohaze" at DEF CON 20. 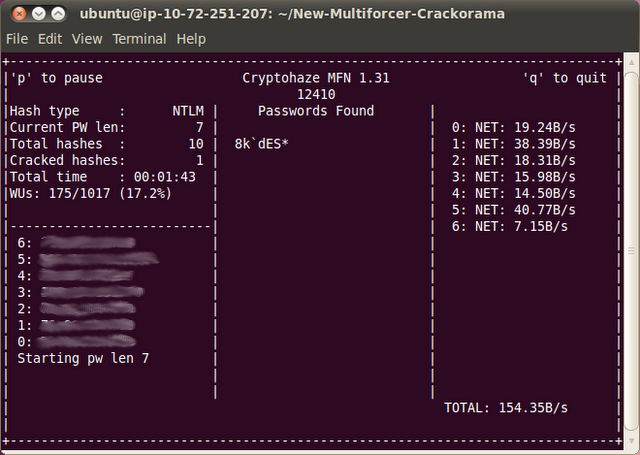 The Cryptohaze Multiforcer supports CUDA, OpenCL, and CPU code (SSE, AVX, etc). All of this is aimed at either the pentester who can't spray hashes to the internet, or the hacker who would rather not broadcast what she obtained to pastebin scrapers. **"Yes, that's 154B - as in Billion. It was done entirely with AMD hardware, and involved 9x6990, 4x6970, 4x5870, 2x5970, and 1x7970 - for a total of 31 GPU cores in 6 physical systems." BitWeasil posted. Bitweasil Bitweasil is the primary developer on the open source Cryptohaze tool suite, which implements network-clustered GPU accelerated password cracking (both brute force & rainbow tables). He has been working with CUDA for over 4 years (since the first public release on an 8800GTX), OpenCL for the past 2 years, and enjoys SSE2 as well. Bitweasil also rescues ferrets. Cryptohaze tools are aimed at providing high quality tools that run on any platform - Windows, Linux, or OS X. The tools run on all platforms that support CUDA or OpenCL (currently Windows, Linux, OS X). If you don't have a GPU - the OpenCL code will run just fine on your host CPU! The releases are now combined into single releases. As an example, on a list of 10 hashes, the Cryptohaze Multiforcer achieves 390M steps per second on a GTX260/216SP@1.24ghz card. On a list of 1.4 million hashes with the same card, performance drops to 380M steps per second. This is the password stepping rate - not the search rate. The search rate is 380M * 1.4M passwords per second!